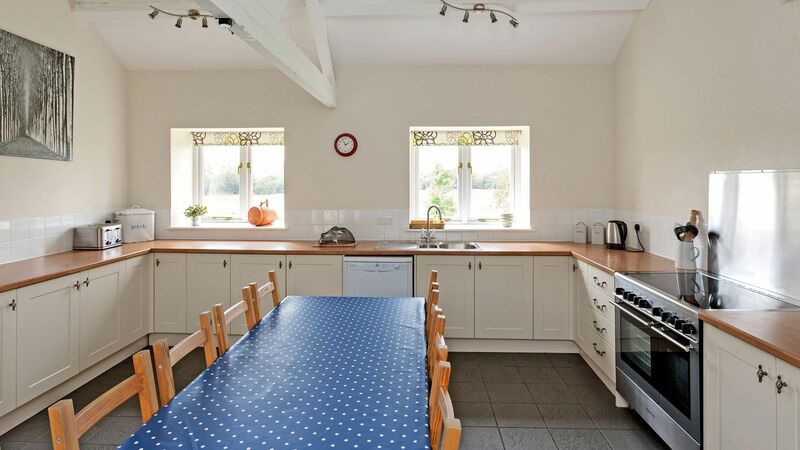 Rose Barn is a spacious and light holiday home providing accommodation for 8-10 guests on one level. The property offers flexible sleeping arrangements, perfect for families or groups of friends. There is plenty of entertaining space, including kitchen, dining area and sitting room. The enclosed courtyard to the front of the property makes it particularly safe for small children and pets (very dog-friendly! ), while the surrounding countryside is fantastic for keen walkers, cyclists and those wanting an escape from it all. Situated in the Chimney Meadows Nature Reserve, it is very peaceful and not too far from civilisation, including the historic town of Burford and the bright lights of Oxford. Large sitting room with wood burner, TV/DVD & wireless speaker. The area features floor to ceiling windows, overlooking the pretty courtyard, with an adjacent loo. Dining area with table & chairs for 8-10. Spacious & well stocked kitchen with fridge/freezer, cooker & dishwasher. 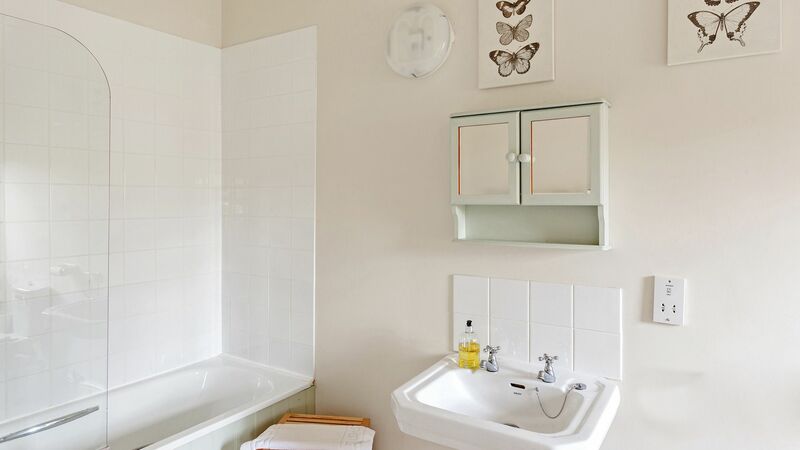 Useful utility room with washing machine, tumble dryer & sink. Bedroom 1 – Master bedroom with super king zip/link bed (and single bed on request), drawers and hanging space, plus en-suite bathroom (with fixed shower above). Bedroom 2 – Super king zip/link bed, with drawers and hanging space. Bedroom 3 – Family room with superking bed & single day bed, with drawers and hanging space. Bedroom 4 – Double zip/link bed, with drawers and hanging space. Family bathroom with bath and separate walk-in shower. Enclosed courtyard garden with lawn and pretty flower beds, plus terrace with charcoal BBQ, outdoor table, parasol and seating. Have a glass of wine with friends whilst enjoying the stunning views and tranquillity of the surroundings! There is gravel parking to the front of the property for 2-3 cars. We do ask you to car share where possible! Rose Barn was a truly amazing place to stay. We loved the photos we saw of Rose Barn before we arrived but we were still very impressed with the size of all the rooms and the cleanliness. We were met as we arrived and shown around. We were a group of 7 adults and 3 children (5 years old and 2 toddlers) the barn was very child friendly and very spacious. We were delighted that no one else heard my toddler cry in the night (we had the middle bedroom) due to the solid walls. We definitely recommend Rose Barn and we will definitely we back!” Rose Barn was a truly amazing place to stay. We loved the photos we saw of Rose Barn before we arrived but we were still very impressed with the size of all the rooms and the cleanliness. We were met as we arrived and shown around. We were a group of 7 adults and 3 children (5 years old and 2 toddlers) the barn was very child friendly and very spacious. We were delighted that no one else heard my toddler cry in the night (we had the middle bedroom) due to the solid walls. We definitely recommend Rose Barn and we will definitely we back! We rented this for a long weekend away with friends it was really big and was so close to the beautiful countryside. We stayed in Rose Barn for a large family gathering, and found the property to be perfect for our needs. James was very helpful during the booking process. Would not hesitate to recommend. We spent Christmas and New year at Rose barn and it had everything that we required - spacious, warm, good sized bedrooms, well equipped kitchen for roasting a turkey for Christmas and two ducks for New years Eve. Lovely fire in sitting room with plenty of sofas and armchairs. In the mornings the winter sun shone in to the sitting room which my 98 year old mother-in-law enjoyed basking in. Although the other two barns were also occupied one was never aware of the neighbours and it was remarkably quiet. Bathrooms all worked well with solid showers. Lovely walks around the barn even in winter when things are wet and boggy. Highly recommend. Located in the Chimney Meadows Nature Reserve, there are plenty of beautiful walks from the doorstep and it really is the perfect escape. The is one lovely walk we recommend from the doorstep, along the Thames Pathway to a great gastropub, The Trout at Tadpole Bridge, where they serve amazing food and dogs are welcome. It is just 30 minutes from the iconic city of Oxford, 45 minutes from the Regency town of Cheltenham and 90 minutes from London. Visit the nearby Aston Pottery and Coffee Shop, or explore the village of Bampton where Downtown Abbey was filmed!